Extraordinary Tales, a seasonal piece of spookery by Raul Garcia, means well but haunts only half-heartedly. The film is a meta-monument to the works of Boston-born, Baltimore-dead Gothic-Romantic wunderkind Edgar Allan Poe, chiefly his short stories but with a side helping of poems: “Annabel Lee” and “A Dream Within a Dream” start us off alongside a nod to “The Raven,” but the meat of the production consists of “The Fall of the House of Usher,” “The Tell-Tale Heart,” “The Facts in the Case of M. Valdemar,” “The Pit and the Pendulum,” and “The Masque of the Red Death.” Garcia presents his movie in anthology format, but he goes against the presentational grain by acting as the sole driving force behind the camera. It’s not that Extraordinary Tales is especially bad. As a spine-tingling delight to tide yourself over as you wait for Halloween, it’s a worthy expenditure of one hour and change. Garcia and his versatile animation department (whose joint credits include films like Song of the Sea and The Congress) pick a different style for every segment, swapping a stark black-and-white palette for “The Tell-Tale Heart” to a softer, vibrant display of endless excesses in the fabulously rendered and altogether ghastly “The Masque of the Red Death.” Not all of their choices end up tilting in the film’s favor—the CG faux-real veneer of “The Pit and the Pendulum” is tragically outdated and undercuts the harsh, whispered vocalizations del Toro layers upon that section—but they give it a necessary sense of variation, rightly lending every story its own visual and tonal identity. But if you have 60 minutes or so to spare and a comfy recliner to curl up in, you may as well just grab a collection of Poe’s writing instead of catching Garcia’s film. 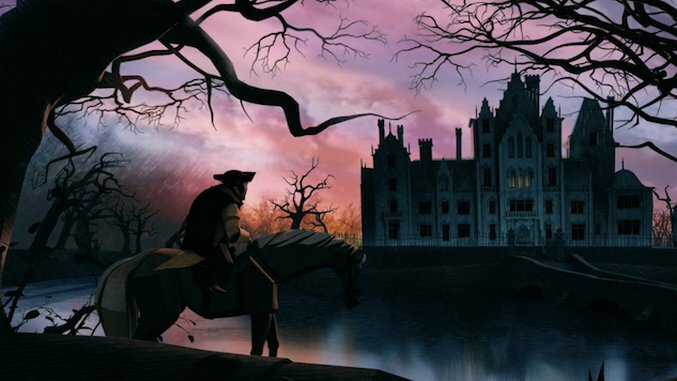 Extraordinary Tales does adequate justice to Poe’s grim fictions, but severely abbreviates all of them to the point of frustration. Even stanzas from “Annabel Lee” wind up being altered. There’s no easily detectable creative reason for the contractions. We can only assume that Garcia cut Poe’s words down to more manageable size for the sake of fitting them into the time allotted him by his funds. If that’s so, then the film deserves our empathy rather than our scorn, but whatever the case may be, Extraordinary Tales leaves us wishing for more: more running time, more of Poe’s material, more of Garcia’s macabre animated magic. Boston-based critic Andy Crump has been writing online about film since 2009, and has been scribbling for Paste Magazine since 2013. He also contributes to Screen Rant, Movie Mezzanine, and Badass Digest. You can follow him on Twitter. He is composed of roughly 65 percent Vermont craft brews.